“The blades allow individuals who have been affected or know someone affected by breast cancer to show their support,” states Don Smith, founder and CEO of Henley Enterprises, Inc.
Henley Enterprises, Inc., the largest franchisee of Valvoline Instant Oil Change is raising funds and increasing awareness for National Breast Cancer Foundation, Inc.® (NBCF). 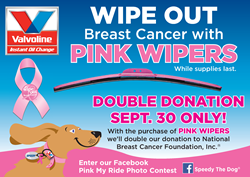 Throughout the month of October a portion of the sales of pink wipers will be donated to NBCF. The wipers are available at over 220 participating Valvoline Instant Oil Change locations in 12 states. Now in its sixth year, the campaign has raised more than $65,000 for NBCF. Customers who have purchased their pink wipers can enter a photo of their car with the new wipers for a chance to win a year of free oil changes. Visit Pink Wiper Contest and Speedy the Dog’s Facebook page for more information. The blades are only sold at participating service centers. Visit VIOC-PinkWipers for a list of stores and #WipeOutBreastCancer to follow the campaign. Valvoline™, a leading supplier of premium branded lubricants and automotive services, has been serving American motorists for more than 150 years. Its operating segment, Valvoline Instant Oil Change℠, ranks as the #2 quick-lube chain by number of stores, with more than 1,070 company-owned and franchised locations in the U.S. Its industry-leading model delivers service you can see from experts you can trust. Visit http://www.vioc.com to learn more. Henley Enterprises, Inc. founded in 1989, is the largest Valvoline Instant Oil Change franchisee. They operate over 220 service centers across twelve states including: California, Delaware, Florida, Michigan, Massachusetts, Maryland, New Hampshire, New Jersey, Ohio, Pennsylvania, Rhode Island, and Virginia. Recognized as one of the leading breast cancer organizations in the world, National Breast Cancer Foundation (NBCF) is Helping Women Now® by providing early detection, education and support services to those affected by breast cancer. A recipient of Charity Navigator’s highest 4-star rating for twelve years, NBCF provides support through their National Mammography Program, Patient Navigation, Beyond The Shock®, breast health education, and research programs. For more information, please visit http://www.nbcf.org.